A savage fish that eats everything it comes across, including people, has been hooked by a British fisherman — sparking fears of a deadly invasion. 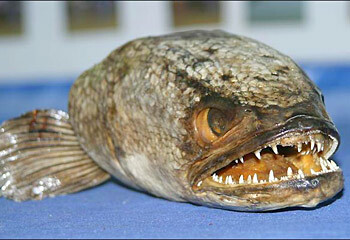 The giant snakehead, originating from South-East Asia, has a mouth crammed with teeth. 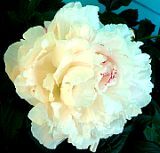 It’s deadly in the water, but it can also “crawl” on land and survive out of water for up to four days. The discovery of the fish in Linconshire, northern England, has caused widespread panic amongst conservationists and anglers. 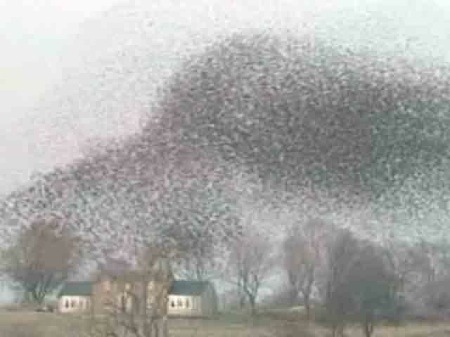 Birdwatchers are being treated to swarms of as many as 500,000 starlings at a time in the skies over Scotland. Hundreds of thousands of the birds have flown to the British Isles to escape the harsh winter weather in Russia and Scandinavia. You wouldn’t need to fertilize your lawn after that flock flew over. Your roof might need washing though.